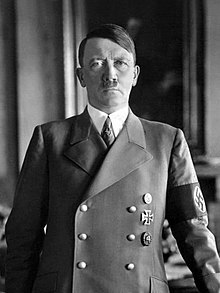 Adolf Hitler (1889–1945) aiva MuGerman politician ani aiva mutungamiri we Nazi Party (NSDAP). a abatanidza German Workers Party 1919 ne ava mutungamiri we NSDAP mu 1921. Hitler aiva zvarwa mu Austria, a bande (paradzana) of Austria-Hungary, ne asimudzira near Linz. This page was last edited on 9 Ndira 2017, at 09:06.